I’ve been volunteering with the Tribeca Film Festival for the past three years. I started off in 2009 as a “key volunteer,” working 14 shifts in 11 days (the entire length of the festival). Working in the Screenings department, I worked inside by scanning tickets and outside by managing rush lines and answering questions. It was a great year and definitely broke up the monotony of my unfortunate unemployment at the time. In 2010 and this year, I was only available to volunteer during the festival’s closing weekends. Typically, I’m not a huge fan of closing weekend. The energy is mostly gone. Everyone’s seen the films. The hype is dead. Nonetheless, I love volunteering with Tribeca and plan to continue doing so, though, ideally, I would be attending the festival in the future as a filmmaker or industry professional. 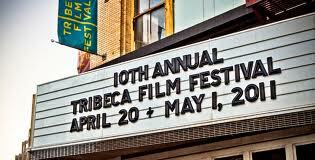 The Tribeca Film Festival first ran in 2002 when Robert DeNiro, Jane Rosenthal, and Craig Hatkoff wanted to bring its brand of culture to lower Manhattan following 9/11. In 10 short years, the festival has grown to become one of the most respected festivals in the United States, bringing to light dozens of new filmmakers, films, and perspectives, all the while proving itself as one of the most accessible festivals for the common movie fan (i.e., it’s not as snobbish as some of its counterparts). Many of the festivals’ films have gone on to earn Oscar nominations and wins, and this year, the festival has become an Academy-qualifying festival for short films, meaning that a short film that’s selected for the festival and wins an award is eligible for Oscar consideration. When 15-year-old Emma lands a competitive spot on the equestrian acrobatics team, she is taken under the wing of a pretty, slightly older teammate, Cassandra. The two begin an intense relationship where the rules of the game blur as psychological stakes get higher and higher. Lisa Aschan’s award-winning directorial debut explores the all-consuming world of teen female friendships through naturalistic direction, evocative imagery, and engrossing performances. The rusting relic of a failed 1960s development boom, the Salton Sea is a barren California landscape and symbol of the failure of the American Dream. Using a stylized amalgam of non-fiction and choreographed dance set to the music of Beirut and Bob Dylan, Bombay Beach revisits this poetically fruitful terrain to find a motley cast, including a bi-polar seven-year-old, a lovelorn football star, and an octogenarian poet-prophet—creating a moving, distinctive, and slightly surreal documentary experience. In 1997, Paco Larrañaga was arrested for the murder of two sisters on a provincial island in the Philippines. Over the next 13 years, his case became the highest profile in the nation’s history, and the focal point in a far-reaching exposé of gross miscarriage of justice. At once an engrossing murder mystery, a courtroom drama, and a stunning indictment of national corruption, Give up Tomorrow is an enraging true crime chronicle. In “Man and Boy,” a father takes justice into his own hands when he thinks his son has been sexually assaulted. “Incident in New Baghdad” recounts a US Army veteran’s personal experience in and out of the war zone. Closing weekend? Now that’s a committed “crew member”! Nice recap, hope you got to see some movies with the vouchers I gave you! I didn’t get to see anything. 😦 I gave half the vouchers to Stephanie and the other half to Janice. Thanks, though!